A beautiful home is constituted of the people who live in it, not necessarily the house and the aesthetic quality in which they live. This does not, however, imply that the beauty of a house cannot be a part of what contributes to the beauty of a home. There are several factors to consider when considering what makes the house as beautiful and as conducive as possible. Besides the optimal decoration of the inner part of the house to suit the pocket, it is significant to pay special attention to the outer and exterior parts as well. This is essential for deciding on paving a driveway. For these creative the very first and a lasting impression on the surroundings. And when considering the nature of such beautification process, the driveway is a very important aspect of any home. There are several reasons why particular attention ought to be placed in the driveway of a home. Emphasis is placed on the nature of the people living in such homes as well as their age grade too. And when it consists of people of an older age and constitution, then it is all the more necessary for the driveway of such homes to be resurfaced, or coated, or paved. Now while some people might consider this kind of ventures an entire waste of time, there are reasons why it should not be pushed to the back of the mind or postponed until it becomes impossible. A paved driveway is relatively and conveniently easier to maintain. So, is an asphalt driveway cost affordable? Well yes, as a result of the fact that they cost pretty less and are considered to be less cumbersome as well. Concrete driveways are known to be able to offer up to 20-4 years of service so that a constant worry about a crack or a hole in the driveway is the least of the worries. 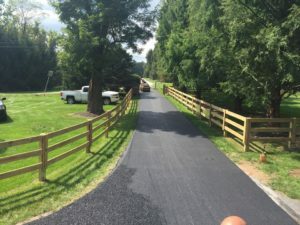 An unpaved driveway can develop patches and holes within a short period of time due especially due to the weight of what goes up and down it. In actual thought, if you look at most of the commercial centers around, you notice that the kind of driveway they possess is a paved or coated kind. This is because paved driveways are famous for their ability to be able to withstand pressure from heavy objects no matter their weight. This makes it important that especially since it is known for its superior resilience, even when it is under a lot of pressure, a concrete driveway is the best choice to explore when considering what kind of drive to install. Remember to check for your asphalt driveway thickness to get an estimate on how long they will last. Imagine taking a hike and then having to walk through grass or mud to get to the front door. Surely, the aesthetic emphasis of the home is expected to be reduced. Paved driveways come in a variance of designs, this allows them to offer the owners of such properties an array of choices to select from when considering the kind of pattern or nature if the design to consider for the drive. Paving comes with a colored stamp, plain stamp, concrete, exposed aggregate, and will definitely enhance the aesthetic quality of the property. During the hot days of summer, when the sun is all out to bear revenge on earth and its inhabitants, paved driveways will never let you down. This is because paving allows your driveway to retain some coolness due to the effect of the sun. It reflects the rays of the sun and allows it to be convenient to not just park but to also recline and walk upon. Especially considering that the body is not as young as it once was and there is no mention of the therapeutic effect such coolness can affect it. Therefore, the glow and reflection of the sun’s rays on the surface of a paved or coated driveway give a calming effect. While also giving an aesthetic touch to the home in particular and the property in general. There are three major steps to paving a driveway, and this includes base preparation, intermediate layering, and final coating. On completion, the entire home takes on a brand new look, this means that the house and property will take on a different and a higher market value as well. This ensures peace of mind and considerate relaxation during the years of retirement. During the process of paving a driveway, a lot of factors are taken into consideration. Now first the technicians have to first check out the capacity of the soil, and then the weather conditions in such areas are taken into consideration as well. This will determine the subsequent procedures. As the next thing to be done will be to use a compactor to pressurize the soil, and in case it is sticky, and sand is usually added. Sometimes, stone or dust is included in the mixture. The middle layer is considerably thick and is expected to retain the pressure to prevent cracking no matter the weight on it. composites so that it does not become so dry that it begins to crack. It also obstructs the growth of weeds and ensures that having to mow the driveway is the least of worries to consider. Due to the fact that it shifts and is loosely packed, gravel can look really messy and incomplete. Due to the several available designs, however, paved driveways are always beautifully patterned depending on the kind of design and color one decides to opt for and this allows it to complement the home. It is a day to day occurrence that driving across a driveway naturally kicks up tonnes of particles such as dust, dirt, rocs as well as innumerable and unidentified debris. This will only happen however assuming the driveway is unpaved. Paved driveways considerably take care of such a worry as this, therefore, contributing to the cleanliness of the home. It also ensures that you don’t have to wash your car time and time again after you park. An unpaved driveway is exposed to the elements. This means that any little weather glitches and there is a lot to regret. The need for constant asphalt driverepair thus is a constant source of worry. Such regrets could be prevented if the driveway was originally paved. During the wet seasons, water sips through unpaved driveways due to their vulnerability, and then when winter comes to take its toll, such water freezes up and therefore expands causing cracks and other kinds of damage to the driveway. Paved driveways do not allow water to pass through their middle due to the tightly packed nature of their designs. When auto-fluids like petroleum and oil spill on the surface of some materials, it becomes impossible to remove as such stains are usually there to stay. With concretely paved and coated driveways, however, such eventualities are prevented as it can be easily cleaned off. Due to the choice available to homeowners during the selection of the driveway design, style, and color, paved driveways affords them the choice of selecting the design and material type to use. Thereby granting the home a style and what in real estate is referred to as “the curb appeal”. This refers to the way the house looks like from the curb. Gravel or sand look unfinished and have a low level of appeal. Paved driveway allows smooth driving, and prevent any damage to the car. It eradicates the chances of getting stuck in a muddy driveway on a rainy day. Paved driveways provide smoother and safer playground for kids. Thereby contributing to the safety of the home in general. This means that the chances of the child picking up something from the dirt for buccal enjoyment is reduced. For the reason that nothing gets stuck in between the driveway. Paved driveways ensure smoothness and are considered cleaner than dirt, pebble, and gravel driveways which damage the tires over time. It also eliminates the chances of tracking due to mud. 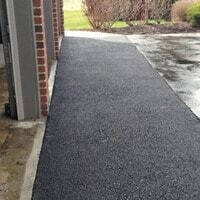 With paved driveways, the chances of having holes in the ground due to consistent usage are eliminated so that the patches and holes that arise in other kinds of driveways are prevented. The need to repeatedly fill in hollow areas and tire tracks is excluded. Considering that paved driveways are considered to be more long-lasting than other kinds, they are considered to be more economical. And are not so expensive to set up either. Paved driveways including asphalt and concrete do not allow water to stay on their surface for long. During the rainy season, there is no need to worry about the flow of water since it is directed towards the right channels by the surface. Unlike mud or sand which absorb the water and cause the ground to be waterlogged. Paved driveways can alternatively serve as a playground and a recreational site for several activities including soccer, basketball, and even skateboarding. Why Should I Employ a Professional to Pave my Driveway? Once it has been established that there is a need to affect the paving of the driveway. It is also important that emphasis is placed upon the need to allow experts in matters such as these to handle them. Of course, they are rated for their professional intelligence, but they also give the best opinions due to the level of experience. Our group of professional are critical with analytical skills. And since the older people are known to actually have less knowledge of more modern twentieth-century projects such as these. Enabling an expert to take on the project is the best choice a property owner can make. They bring in experts such as driveway contractors, driveway pavers, and driveway sealers. If the aim is to impress or to have the eyes of visitors glow with jealousy, then the paved driveway is the best choice. For one, the first encounter anyone will have with your property is going to be from the driveway. This allows it to function as both a utility and a means of attraction as well as a source of envy. Making a paved driveway requires hard labor. There is no one better at guaranteeing the skillset required than an expert at the job itself with years of experience under their belt. It requires complex engineering that you do not have to worry about your tired or old minds about. It also requires a considerate amount of money as well as the acquisition of the right materials and the right labor, therefore, the guidance of the expert should be entirely relied on. They are called experts for a reason. Basketweave, Offset basketweave and a host of others. Each one with its own advantage, another reason why an expert ought to be brought into the scene. Paving and Driveway Contractors are the professionals to look out for once there is a need to pave or coat your driveway. And since an asphalt driveway paving is a large scale project, then it is important for there to be a professional on site. They have access to all the right equipment, and the specialized tools involved in the project. They will also be able to foresee any difficulty that may arise during the procedure. We also know how to maneuver out of them. Driveway resurfacing includes the usage of asphalt over an old and worn out layer. One gets a perfect and flawless jet-black driveway. Driveway resurfacing is usually made necessary due to the telltale signs of damage and the need for repair on the driveway. Get your asphalt driveway installation setup today!